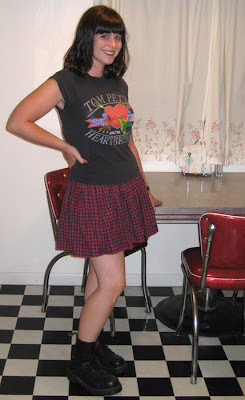 Veronica Darling: Giveaway skirt finds a home! Even better, she sent me the photo and blogged it here! CUTE STUFF! You're a total darling Bethany! You look great and I want those boots! I had a great pair of doc marten steel caps when I was little, but I wore them every day for about 5 years and left them behind in England cause they were too heavy for my luggage. CRY! I think I'll have to get another pair now that I've seen you wear them! Yum! Can't wait to eat them all up! Husbie and I are cooking up something big for the future soon, so we're minding our pennies and saving up dosh! We're dreaming up traveling schemes and family schemes, so hopefully they'll all come together soon. Hey, I was chatting with Mum last night and she said she had a chatsies with your Mum. Hahaha talking crafty daughters and what not! She was rather excited about it all!